Detail of illustration from "A Favourite Song," in Clio and Euterpre, or, British Harmony, A Collection of Celebrated Songs and Cantatas, Volume Three, page 50, published by Henry Roberts, 1762. Detail provided by Peter Plunkett. 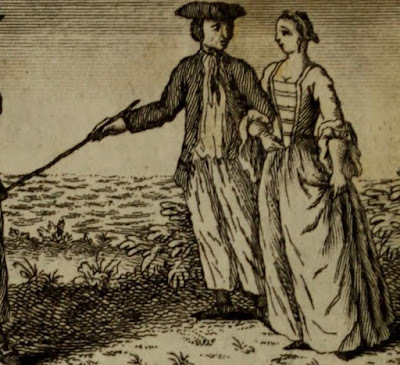 Detail of illustration from "A Favourite Song," in Clio and Euterpre, or, British Harmony, A Collection of Celebrated Songs and Cantatas, Volume Three, page 50, published by Henry Roberts, 1762, Internet Archive. Piggybacking the Sailor's Farewell trope, "A Favourite Song" plays out the tearful farewell of a steady Jack and his love. She assures the sailor that the enemies of his country are her enemies, too. The sailor is heartened by her encouragement, and the bosun praises the fair wind that will "waft us to the foe." The sailor is very typical for the era. He wears a plain cocked hat with the point forward, a long neckcloth over his white shirt, no waistcoat, and a single breasted jacket ending about the top of the thigh. His white trousers are loose and end above the ankle. In his right hand is a stick. What really delights me about this engraving is that it is only the second in my study so far that clearly depicts a bosun. Two details make this an exceptional image. 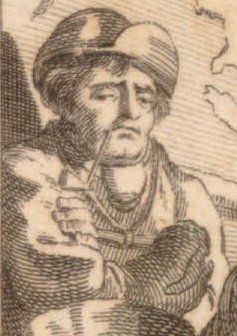 The first is the bosun's pipe in his right hand. A lanyard runs from the bosun's neck down to the pipe, though what precisely his lanyard is made of is pure speculation. The second major detail is the heart at his neck. It looks a bit like a gorget worn by military officers. It is illustrated with the image of a three masted vessel. 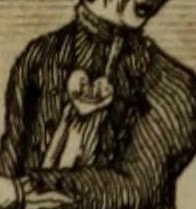 Interestingly, the only other image of a bosun I have come across, an illustration accompanying The Adventures of Peregrine Pickle, also shows the bosun wearing a sort of gorget. It was a detail I missed at the time. I confess, I've never seen nor heard of such a badge. 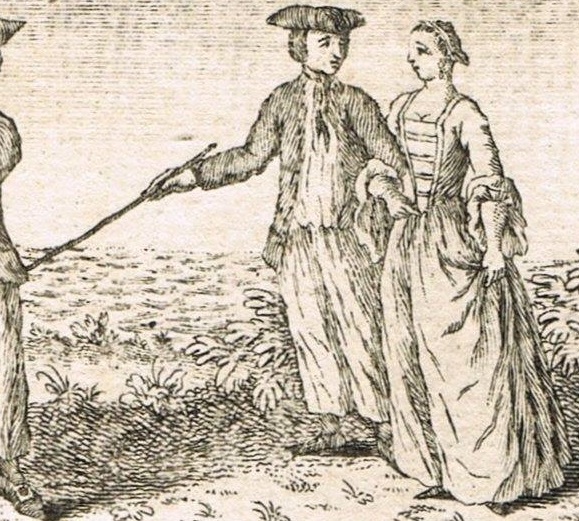 That famous and widely printed satirical pamphlet The Wooden World Dissected identifies but three major symbols of the bosun's position: the pipe, cat, and rattan. Granted, as NAM Rodger warns in his book The Wooden World, it is quite possible that the author of that pamphlet had not actually been to sea. I'll keep searching, but if you have any idea what this object is, leave a comment below!